One of the coolest things about my NAMM visit was hanging out at the Framus display and checking out the revamped Panthera line. 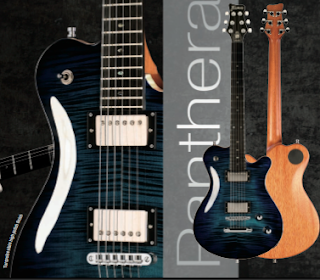 Each Panthera is loaded with Seymour Duncan pickups, and each is aimed at a different type of player. 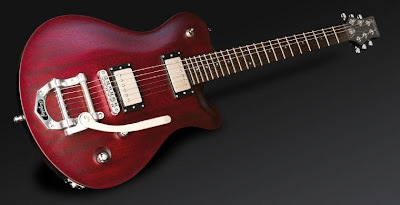 Framus has been working on the new line for over two years and have managed to strike a pretty impressive balance of playability, tone and finishing, while maintaining an independent style. You see one of these babies and you know it’s a Framus. Models include a natural satin finished Panthera with SH-2 Jazz and SH-4 JB humbuckers; the Panthera Supreme with AAA flamed maple top and SH-1 ’59 and SH-14 Custom 5 humbuckers; the Panthera Legacy, a Bigsby-loaded version with PH-1N Alnico II Pro and SH-PG1B Pearly Gates humbuckers; the bolt-neck Panthera Studio with APH-1N Alnico II Pro, APS-1 RW/RP Alnico Pro II staggered single coil and SH-5 Custom; Panthera Studio Supreme which adds a AAA flamed maple top to the Studio; and the Panthera 7-string, sporting a set of active Blackouts Phase I AHB-1N 7 and AHB-1B 7. I was quite taken by the 7-string – the neck wasn’t too chunky nor was it too thin, and the fretwork was spectacular – Framus makes great use of the PLEK system to achieve this. Seymour Duncan Blackouts are pretty cool too! But as much as I dug the 7-string (and the Panthera Studio Supreme) I was also into the Panthera Supreme with Bigsby – anyone who’s read this site for a while or has talked guitars with me over a few beers will certainly know how much of a Bigbsy geek I am, despite my predisposition towards shreddy guitars. I also checked out the Diablo series, again loaded with Seymour Duncans. The models include: the swamp ash Diablo (SSCR-1N Cool Rail, SSL-1 RW/RP Vintage Staggered Single Coil, STB-4 JB Trembucker; Diablo Progressive (mahogany body, TonePros wraparound bridge, AHB-1 active Blackouts Phase 1, AHB-2 active Blackouts Metal ); Diablo Progressive X with Floyd Rose, SH-2N Jazz Model, STB-6 Distortion Trembucker; Diablo Supreme (mahogany body with AAA flamed maple top, TonePros wraparound bridge, SH-1 ’59 model, SH-4 JB model; Diablo Supreme X (Wilkinson by Framus vibrato bridge, SSCR-1N Cool Rail, SSL-1 RW/RP Vintage Staggered Single Coil, STB-4 JB Trembucker; and Diablo 7-string (mahogany body, TonePros Tune-o-matic bridge, Blackouts Phase 1 AHB-1N 7, AHB-1B 7. 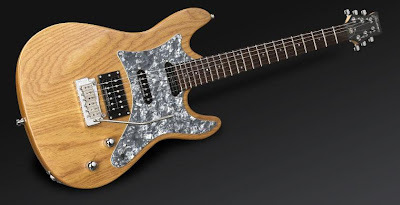 The Diablo Progressive X was pretty cool – I couldn’t resist a few hyperspeed runs, hehe – and I was blown away by the traditional-yet-modern feel of the swamp ash Diablo. For more info visit Framus’s website. Remember my review of the Morpheus DropTune a little while ago? Well at NAMM they also had the DropTune’s new sibling, CAPO. CAPO works almost like a DropTune in reverse: use it to raise the tuning of your entire guitar by up to… 3 1/2 freaking steps! It can be used to emulate a 12 string with an intelligent setting which adds the higher octave for the E, A, D and G strings while doubling the B and high E. How does it do it? I have no freaking idea but it sounds amazing. UP tuning in 1-step increments up to 3 1/2 steps — plus full Octave and Octaver. Our CAPO™pedal’s sibling, the DropTune™, has taken the guitar world by storm because it does something no other pedal has ever done before. Now we’ve done it again — except upscale! Finally, you can electronically capo your guitar and maintain perfect pitch. For example, play an E chord in standard tuning, then use the Capo pedal to up tune your guitar so the chord is changed to an F, F#, G, G#, A, Bb or B. 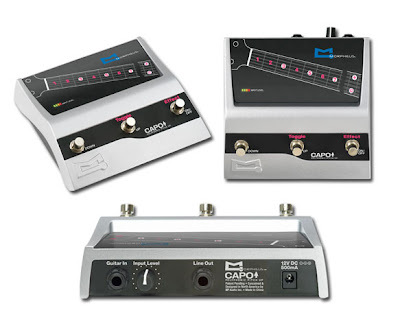 In addition, the CAPO pedal has Full Octave Up Pitch and a great-sounding Octaver/12- string emulator that causes your 6-string to sound like a 12-string, with octaves for strings 3 through 6, and doublers on strings 1 and 2. The Morpheus CAPO™ pedal also features effect-toggling so you can instantly toggle back and forth between the up pitch and the EFFECT OFF for a cool up/down pitch-shift effect during rapid ascending/ descending arpeggios and scale runs. Don’t mistake this for a mere pitch shift stompbox. The CAPO uses proprietary polyphonic pitch up algorithms that maintain perfect harmonic accuracy and tonally correct overtones — you have to hear this pedal to believe how real it sounds! Not surprising considering the CAPO™ has been developed by a team of guitar effects pros with over fifty total years of experience at other companies where they created some of today’s most famous pedals. With a cast metal chassis, solid positive-feeling steel step switches and non-skid rubber feet, the CAPO is solidly built for years of use and abuse. LED indicators are bright and easy to see. If you’re looking for fast, pitchperfect capoing, listen to the demos on our website…or better yet, try out the CAPO in person at your Morpheus dealer. A couple of weeks ago I toured the Taylor factory and got to see these awesome guitars coming to life. One of my favourite things about Taylor’s current offerings, and one of my NAMM highlights, is their new tremolo, available on all of their SolidBody offerings. I spent a bit of time at NAMM checking out this trem and I was really impressed with how smoothly it operated. It kinda feels like a very well set-up Bigsby in terms of feeling substantial yet light at the same time, while giving the range of pitch-drop that you would expect in a standard two-point fulcrum design. And you can set it to float or to only go flat. Cool! Lots of huge news from Seymour Duncan at NAMM this year, not the least of which is the endorsement of Yngwie Malmsteen, followed very closely behind by the new Slash signature pickup. All of Seymour Duncan’s NAMM press releases are here, but first, check out this awesome effect by Yngwie Malmsteen and Seymour Duncan to raise money for victims of the Haiti earthquake. 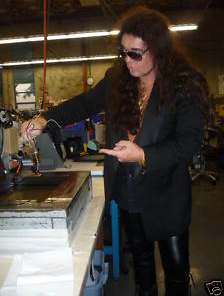 On January 18, 2010, rock guitar icon Yngwie Malmsteen came to the Seymour Duncan factory for a post-NAMM factory tour. During his visit, Yngwie wound his first ever electric guitar pickups: a set of three true single coil pickups for Stratocaster® guitars. Tutoring him on winding technique was Seymour Duncan Custom Shop manager, Maricela Juarez. The pickup’s design is based on Leo Fender’s vintage pickups designs for the Stratocaster®. The magnets are sand-cast Alnico 2. The bobbins are hand-fabricated from forbon vulcanized fiber. The magnet wire is vintage-correct Heavy Formar. The d.c. resistance of the neck and middle pickups are 6.40K ohms each, which makes them vintage voiced. At 9.70K ohms, the bridge pickup is over-wound for a hotter, higher-output sound. Each pickup comes with an aged white cover and is ready to install into a Stratocaster® or similar type electric guitar. Each pickup has been wax potted by Yngwie for squeal-free performance. Yngwie signed the bottom plates of each of the pickups as well as the description labels for each (six signatures total). You can hear Yngwie talk about his experience winding the pickups and even see Maricela giving him tips on the YouTube video that documented this very special day and these unique electric guitar pickups. Seymour Duncan’s CEO, Cathy Carter Duncan also appears in the video. Whether you are a collector of rock star memorabilia or a guitar tone aficionado, this one-of-a-kind set of working pickups hand-wound by the King of Shred himself will be the crown piece in the winner’s collection. As Yngwie mentioned on the video, all proceeds from the auction of this very special set of pickups will be donated to Doctors Without Borders/Médecins Sans Frontières (MSF), the international humanitarian aid organization that is providing aid to Earthquake devastated Haiti. More than 700 MSF staff members are working to provide emergency medical care to survivors in and around Port-au-Prince. Yngwie and Seymour Duncan are doing their part to help out. You can too. And you’ll end up owning an amazing set of pickups. CLICK HERE to see the auction on eBay. There was lots of great stuff on show at the Seymour Duncan booth at NAMM this year, and I was pretty excited to meet Evan Skopp and Rick Turner. Unfortuntately my booth visit didn’t coincide with Yngwie’s, but hey, there’s a great interview with Yngwie by Evan a little bit down the page here, so I’ll just enjoy that instead. Santa Barbara, California Relentless pursuit of the perfect tone. We’ve all experienced it. It never subsides. When Yngwie said he wanted to take his tone to the next level, we listened. No other guitarist unleashes the fury like Yngwie J. Malmsteen. His influence is undeniable. His technique is unparalleled. His pickups? Seymour Duncan. Yngwie needs a pickup that responds to his unique playing style. After hundreds of hours of intense tone pursuit, their labor or love yielded the STK-S10 YJM Fury. Beginning with Seymour’s original Stack® pickup design, these hum-canceling single-coil-sized pickups were designed to meet Yngwie’s personal tonal desires. The YJM series includes a dedicated bridge pickup and separate neck/middle pickup. It’s recommended for neo-classical, shred, hard rock, power metal, and heavy metal. Dedicated bridge and neck/middle pickups represent two highly customized voices. In the bridge position, Yngwie wanted more aggression, more power. The neck pickup needed to balance Yngwie’s fluid left hand technique with his broad mix of right hand pick attack. The result is a pickup that’s sweet and fluid, but with more articulation and responsiveness to dynamics. The YJM Fury is available with white, off-white, or black covers and can directly retrofit most single-coil equipped guitars. It also comes pre-installed in the signature series Fender® YJM Strat® guitar but works well with any guitar that utilizes traditional single-coil-size Strat pickups. All Seymour Duncan and Basslines pickups, are hand built in the USA and include all necessary mounting hardware. Fender and Strat are registered trademarks of FMIC with which Seymour Duncan is not affiliated. 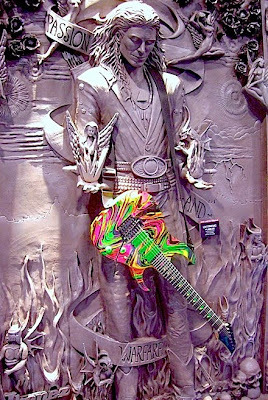 Santa Barbara, California He is, by many accounts, history’s all-time greatest guitar hero. With the ubiquitous top hat and shades, mop of black curls obscuring his face, and a blazing electric guitar tone blasting through a wall of amps, Slash epitomizes the very reasons we first air-strummed a low-slung tennis racquet in the privacy of our bedroom. He is the seminal rock guitar god. And for over three decades he has relied on Seymour Duncan pickups for his guitar tone. Now Seymour Duncan honors their guitar hero with his first signature pickup, the Alnico II Pro Slash. The tone of this pickup will be familiar to all who have heard Slash’s recorded tone. Though he has dozens of amazing guitars, since 1986 Slash has used pretty much one very special Les Paul® for all recording. The Alnico II Pro Slash was designed to give Slash’s other Les Paul guitars-what he calls his “live guitars”-the exact tone of this legendary instrument. Like the standard APH-1 Alnico II Pro, which he has used for years, the Slash model uses an Alnico 2 magnet. However, the Alnico II Pro Slash is wound with just enough boosted output to push a stock Les Paul toward the sweet sustain and rude crunch that characterizes Slash’s sound as heard on hundreds of recordings. In addition, it comes with some of the same appointments found on the Duncan pickups in Slash’s ’86 recording axe, including single-conductor cable, long-legged bottom plate, and wooden spacer. For the true fan, or the player who wants to capture Slash’s recorded tone, this pickup is a critical part of the tone chain. While designed for use in a Les Paul, this pickup works well in any well-balanced humbucker-equipped guitar including hollow and semi-hollow body guitars. The Slash aficionado will use a pair of these pickups to capture that unmistakable tone. This pickup matches well with Seymour Duncan’s SFX-04 Twin Tube Blue all-tube overdrive-distortion stompbox for singing leads and authoritative chording. The Alnico II Pro Slash is hand built in Seymour Duncan’s Santa Barbara, California workshop and including all mounting hardware. Les Paul is a registered trademark of Gibson USA with which Seymour Duncan is not affiliated. Now, Seymour Duncan introduces the SHPR-2b P-Rails® Hot, delivering the same tonal flexibility as its predecessor, but specifically designed to provide a punchier, more aggressive tone in the bridge position. The P-Rails Hot features a beefed up coil wind and 2 powerful Alnico 8 magnets, which rival ceramic magnets in power but maintain the sweet sustain Alnico is known for. The P-90 coil in the P-Rails Hot is wound with a special wire type, selected for output and clarity. This P-90 is loud! The rail mode is hotter thanks to the power of the Alnico 8, and the series humbucker mode is huge! P-Rails Hot are a direct humbucker retrofit and can be used in any guitar set up for a traditional humbucker or Trembucker spacing. To maximize P-Rails Hot’s unique splitting capabilities and get the most tonal versatility, it is recommended for use in tandem with a standard P-Rails in the neck position with a two-way switch (push-pull or mini-toggle) to get both humbucker and P-90 tones. Use a three way switch (DPDT on-off-on) to bring in the single coil Rail tones. Or for the ultimate in versatility, use Seymour Duncan’s Triple Shot switching mounting ring. Santa Barbara, California The Seymour Duncan Custom Shop has been custom-building 7-string electric pickups upon request for years. Now, to keep up with the demand for 7-string pickups, the company is introducing production versions of some of their most popular models, including the SSL-1 Vintage Staggered 7-string and the SSL-5 Custom Staggered 7-string, specifically designed with a modern stagger for the needs of the 7-string player. The Vintage Staggered 7-string delivers a deep punchy tone with bright sparkle for single-coil strat.® guitars, recommended for country, pop, surf, rockabilly, blues, ska, classic rock and any player that wants to marry a vintage sound with the new era of 7-stringed guitars. Complete with hand-ground Alnico 5 magnets, it compliments a humbucker like the SH-4 JB 7-string in the bridge position, along with a neck pickup like the SH-1n ’59 7-string. Add an all-tube overdrive like the Seymour Duncan SFX-11 Twin Tube Blue for the ultimate tone. The Custom Staggered 7-string pickup provides a distinct vintage tone with greater sustain and full sounding harmonics that cuts through the mix, but cleans up nicely when you back off the volume. It’s 6-string counterpart has been championed by countless artists over its long history for its strong, overwound Strat tone, most recently making an appearance on Fender’s David Gilmour Signature Series Strat®. Pair this pickup with a high output bridge pickup like the SH-10 Full Shred 7-string, and a moderate output neck pickup like the SH-2n Jazz 7-string, for great tone when playing Texas blues rock, classic rock and heavy rock. Both pickups come with a black cover, are produced at the Seymour Duncan factory in Santa Barbara California, and will make their debut in January at the 2010 NAMM show. Santa Barbara, California Seymour Duncan is announcing the release of several of their most popular pick-ups, specifically re-designed to capture the deeper tones and wider range of sound found in the new generation of seven-stringed instruments, including the SH-10 Full Shred 7-string and the SH-14 Custom 5 7-String humbucker. 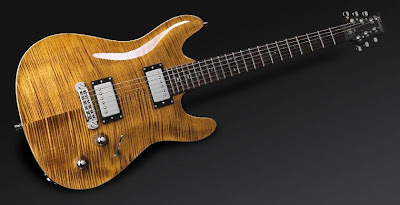 The 6-string Custom 5 was developed in part by contributors on the Seymour Duncan web user group forum who replaced the magnets in their Custom or Custom Custom with Alnico 5 magnets. The versatile Custom 5 7-string is a moderate to high output humbucker, perfect for pop, country, blues, classic rock and heavy rock with its deeper bottom end and expanded output. Recommended for the bridge position, add an SH-1n 7-string in the neck position for real deal P.A.F. tones. Shredders and metal-heads will elate in the high output that the Full Shred 7-string offers. For years, the Seymour Duncan Full Shred has been revered for its top end clarity, crisp, well defined low end, and aggressive midrange, great for capturing clear, tight tone during heavy rhythms and speed riffs. Two symmetrical coils and short Allen head pole pieces produce a more intense, focused magnetic field while the Alnico 5 magnet maintains an organic attack and feel. The Full Shred is perfect for rock, heavy metal, speed metal, and any music featuring fast, aggressive, solo playing. It comes with a four-conductor hookup cable for various switching options, in both bridge and neck versions, and matches well with the SFX-04 Twin Tube Mayhem for ultimate heaviness. Both pickups will debut in January at the 2010 NAMM show in Anaheim along with several other pick-ups redesigned by the Seymour Duncan company, to meet the growing fan base of seven-stringed guitar players. Santa Barbara, CA -Seymour Duncan announces the release of the latest addition to our popular Blackouts Humbucker series the Blackouts AHB-3 Thomson EMTY. Like its predecessors (The AHB-1 and AHB-2), the Blackouts AHB-3 EMTY provides distinctive, screaming metal tones, packing a serious mid-range punch, thicker, darker chords than other humbuckers and hard-hitting driving leads. The 9-volt active Blackouts are designed specifically for more aggressive playing styles including players using extreme low tunings. The EMTY takes it a step further, created to meet Mick Thomson’s personal specs and metal desires. Mick asked for tighter bottom, and more searing top end cut, and Seymour Duncan delivered. The AHB series conveys a less compressed tone, with a more extended frequency response helping to cancel hum by using balanced inputs. Blackouts are up to 14dB quieter than any other active pickups, while producing more lows, more highs, and more output. Simply put, Blackouts have more tone than other active pickup. And players have noticed the benefits of the reduced hum, especially during recording. Thomson was already an avid fan of the Blackouts when he met Seymour Duncan Head of Artist Relations, Evan Skopp during a discreet backstage meeting at the 2008 Loud Park festival in Japan. Mick stayed involved every step of the way from the precise wiring configuration to the logo and printing on the pickup including his renowned “seven” imprinted right on the side of the cover. Now he depends on EMTY to execute his completely psychosocial tone that defines the Slipknot sound; because to play extreme metal, you need extreme metal tone. AHB-3 Blackouts EMTY are available as Mick’s two-humbucker set, or in individual neck and bridge models to mix and match with other Blackouts and Livewires Classic II active pickups. All versions come with all necessary mounting hardware, including pots, jack, and a battery clip. For players with active pickups already installed, the EMTY can plug right into the quick connection harness, making it a snap to unplug the old pickup and plug in the new EMTY. To celebrate this new release, Seymour Duncan is giving fans the chance to win Mick Thomson’s signature Ibanez© MTM1 with Mick’s new signature Seymour Duncan Blackouts EMTY installed. Ten second place winners will receive signed sets of EMTY pickups and a host of third place winners get Slipknot or Seymour Duncan swag. To win, contestants need to go to: www.seymourduncan.com/mickblackouts and enter into the drawing. The contest runs to midnight January 31, 2010. Santa Barbara, California – When six strings seem too conventional and seven strings still just aren’t enough, Seymour Duncan announces the release of the latest version of our hugely successful Blackouts series, the 8-string Blackouts for 8-string guitars. For the new generation of 8-stringed guitars, 8-string Blackouts provide more headroom while still generating thick and full lows without sounding muddy or dull. Designed from the ground up specifically for the need of 8-string players, these metal beasts contain ceramic magnets for both the neck and bridge versions, specifically voiced for heavy rock with greater dynamic range, less scooped mids, and less compression than other active pickups. For anyone who has tried to record using an 8 stringed guitar, the biggest complaint has been that most pickups deliver a thudy sound, chopping off the dynamic range. The results can be clearly seen, like a “flatline” effect in the recording wave. 8-string Blackouts allows each register to have its own character, like you expect from any six string sound, but now with deeper bass lines and no flat-lining. It simply allows the player be more expressive. The industry agrees that 8-string Blackouts are clearly an improvement, evident by the fact that many guitar makers like Schecter© Guitars, who are delving into the 8-string guitar world, are offering the 8-string Blackouts. Their latest, offering the Schecter BlackJack ATC-8 limited edition guitar comes with 8-string Blackouts installed. Like the full line of Blackouts, the 8-strings provide a tone that sounds less compressed with a more extended frequency response. Blackouts active humbuckers are up to 14dB quieter than the competition, but they also have more lows, more highs, and more output. Blackouts 8-string are designed to direct retrofit any 8-string electric guitars and are available in individual neck and bridge models, or as a two-pickup set. All versions come with all necessary mounting hardware, including pots, jack, and a battery clip. Seymour Duncan Serves Up A Triple Shot! Santa Barbara, California – Guitarists are always striving to conjure as many sounds as possible out of their instrument. One of the ways to do so is by altering the wiring of the pickups to split coils (also known as a “coil cut”) or change from series to parallel. Typically, when guitars are modified to add different pickup routing and tonal options, it’s necessary to add extra toggle switches and/or push/pull pots. These extra controls can be confusing, unattractive, and in the way. In some cases, permanent modifications may also decrease the resale or collector’s value of an instrument. What do you do if you need these options but don’t want to modify your guitar’s construction or appearance? Seymour Duncan has developed a unique stealth switching system to do the job–the incredible Triple Shot which cleverly conceals the switching system inside a humbucker-size mounting ring. Now there’s no need for drilling holes for extra switches, pots or visible modifications to achieve your custom wiring wishes. Two small switches built into the mounting ring are all that’s needed to do the job. The Triple Shot is easy to install and works with any four-conductor Seymour Duncan humbuckers, and just about any other manufacturer’s four conductor pickups. Simply connect the pickup’s leads to a small color-coded circuit board which adheres to the guitar’s inside cavity, then connect the ground and hot wires to the circuit board and you’re ready to rock. No fuss, no muss, no permanent modifications. Triple Shot is available in black and cream. Alright, that’s it. I’m gonna get one of these pedals and turn myself into instant Alice In Chains. Never mind that I can’t write songs as good as them and I don’t look as cool in vintage thrift-store leather jackets. I’m gonna do it. Check out this YouTube video of the Vocalist Live 3 in action. SALT LAKE CITY, Utah, DigiTech, a leading manufacturer of vocal processors, and a Harman International company (NYSE-HAR), has announced the newest addition to the Vocalist product line, the Live 3. 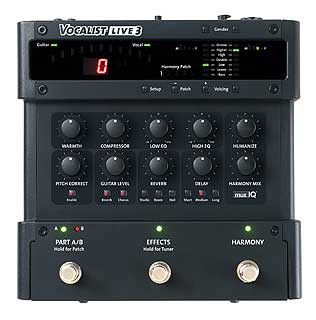 The Live 3 provides guitarists a 3-part vocal harmony, pitch correction, and vocal pre-effects in a single pedal. Using patented musIQ® technology, the Live 3 continually follows the notes being played on the guitar and the lead voice to generate accurate and musically correct vocal harmonies. musIQ eliminates the need to pre-program the songs’ key or key changes to create get accurate harmonies, making the Live 3 much easier to use. 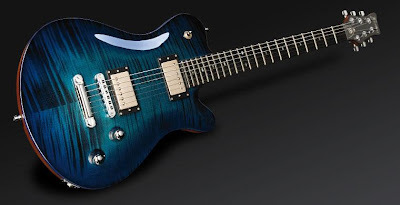 Here’s a run-down of the new Paul Reed Smith SE models released at NAMM this year. I got to see these axes close-up and I really dig the Opeth model and the Zach Myers one. But perhaps the coolest news of the show for me was that Orianthi told me her SE model will also be released with a Floyd Rose not too far down the track. PRS Guitars is proud to announce that Orianthi, Zach Myers of Shinedown , Paul Allender of Cradle of Filth, Mike Akerfeldt of Opeth and Nick Catanese of Black Label Society will have their signature SE models unveiled at the 2010 Anaheim NAMM show. Built in Korea to signature artist and PRS’s specifications by skilled craftsmen, the SE series offers an unmatched combination of incredible quality, sound and price. PRS has worked closely with each artist to present a guitar that identifies with their style, both musically and visually. Although they have worked with PRS for years, these are debut signature models for Orianthi, Myers, Akerfeldt and Catanese. EMG pick ups as well as old school birds, an appointment that up until this year has been reserved for Maryland made PRS guitars, come standard on several of these new artist models. A classic PRS sound with white pearloid birds and red sparkle finish, the Orianthi SE model is the very first signature model instrument bearing the guitar goddess’ name. It comes standard with a Korina back and maple top, 24 fret wide-thin maple neck with 25″ scale length and an ebony fretboard featuring white pearloid birds and an “O” at the 12th fret. The model also features PRS designed Tremolo and PRS designed tuners with nickel hardware and two humbucking pickups to give new and seasoned players alike a shiny new ax to grind. As the lead guitarist of a band with more than six million albums sold worldwide, Zach Myers is certainly no stranger to hard rock licks. In support of his blazing guitar skills, PRS and Zach designed his very first signature model. Silver Sparkleburst and white binding on top edge of body, fretboard and headstock, the SE Zach Myers also features a Singlecut mahogany body, flamed maple veneer, wide-fat mahogany 25″ scale length neck and an ebony fretboard with a Fleur-de-lis inlay at 12th fret. Additional features include an adjustable bridge (with large caps on the height adjustment screws), three humbucking pickups with two volume and two tone controls, 3-way toggle. As the lead vocalist and guitarist for the acclaimed death metal band Opeth, Mikael traverses the musical terrain with sounds that are “subject to savage punctuations of death metal fury at any given moment.” Akerfeldt once commented on the diversity of Opeth’s music. His new model follows suit with a singlecut mahogany body, maple top and flame maple veneer, maple neck with ebony fretboard, 24 jumbo frets, original PRS bird inlays, PRS designed tremolo bridge, gold hardware, HFS and Vintage Bass pickups, volume, tone, 3-way toggle. A Tortoise Shell finish with a Opeth “O” logo on body give this guitar a unique look to compliment a unique voice. 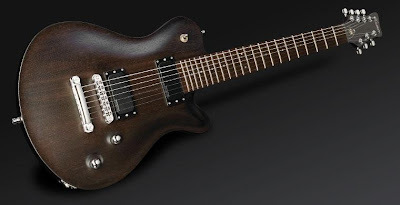 Nick Catanese and PRS have created a signature model SE worthy of Nick’s “Evil Twin” moniker. Starting with an extra-thick Singlecut mahogany body, the guitar tops off with a Gloss Black finish with red binding on body, neck and headstock, and and “Evil Twin” logo on body. 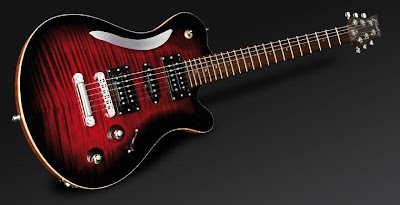 The model also features a mahogany neck, ebony fretboard, 22 jumbo frets, no inlays, TonePros adjustable stoptail bridge, and EMG 81 and 85 pickups with red pickup rings. Other appointments include volume, tone and 3-way toggle on upper bout. 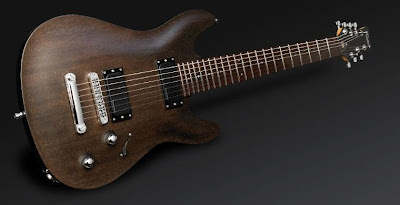 Cradle of Filth guitarist’s ever popular model is updated with new pickups and new colors for a filthy new take on Paul Allender’s namesake ax. Now available in available in Emerald Green Burst or Scarlet Red Burst, the double-cutaway mahogany body still has a flame maple veneer and a special arm carve. Additional features include rounded edges on the body, maple neck with ebony fretboard, 24 jumbo frets and the bats in flight inlay. New EMG 89 and 81-TW pickups with coil tapping give the guitar an updated sound, and a tremolo bridge, nickel hardware, push-pull volume, push-pull tone and 3-way toggle switch are also featured. Now that I’m back home in Australia I’m sorting through my NAMM photos. Here are some more pics and a press release about the UV77REMC, the new 20th anniversary reissue of the UV77MC. It was 20 years ago when Steve Vai joined forces with Ibanez to produce his ultimate weapon, the 7-string Universe, the first production 7-string solid-body electric guitar. 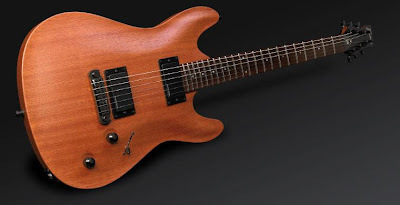 The groundbreaking Universe was quickly recognized as the “Most Innovative Guitar of the Year” by music retailers at the 1990 Music and Sound Awards. Originally designed as a virtuoso shred machine, the guitar would have a new life later in the ’90s with its extended low-end range making possible the new breed of rhythmic metal of heavy music players such as Korn and Dino Cazares. Ibanez is proud to recognize Steve Vai’s achievement with the release of the new UV77RE Universe 20th Anniversary edition. Like the original, the solid body UV77RE reissue is seven strings of fire, ready-made for maximum shred and some of the meanest riffing on the planet. The multi-color swirl motif arrives once again from the original Universe artist, Darren Johansen. 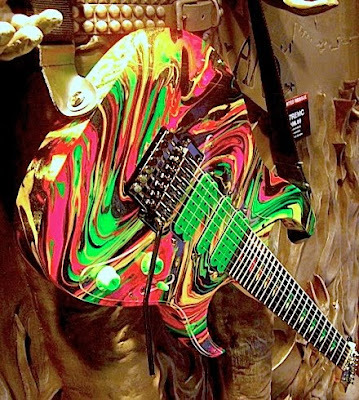 Because of the swirl paint process each Universe guitar is uniquely individual in appearance. As with Ibanez’s other Limited Edition Reissues such as the famous Bob Weir model, all UV77RE models are crafted in Japan by the same luthiers who created the originals. 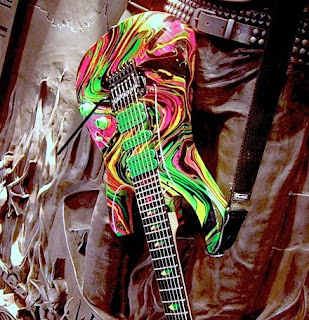 1990 not only brought the Ibanez Universe guitar to the world, it also debuted Steve Vai’s groundbreaking, earth shattering album, “Passion and Warfare,” and each U77RE comes with a commemorative poster of this sonic masterpiece. Only 100 UV77RE reissues will be available worldwide.